The Canadian Army has restricted the use of its high-tech artillery shells after the U.S. military discovered cracks in the same warheads in its inventory. The 155mm Excalibur shells are guided to their targets by Global Positioning System satellites and cost more than $150,000 each. But the U.S. is warning that the cracks could cause premature detonation of the rounds. This revelation has created a buzz amongst the arms manufac ..
18 June 2014 - Macleans.ca - Late last night in the Senate, Romeo Dallaire, the retired lieutenant-general who famously led a UN peacekeeping force in Rwanda during that country’s genocide, delivered his last speech as a senator in the red chamber. Dallaire, who announced in May that he would retire from the Senate, bid farewell to the upper chamber while addressing Canada’s place in the world and the current situation in the Central African Republic. The following is the text of that speech as recorded in Hansard. 29 May 2014 - Canada.com - SOMEWHERE OVER UKRAINE — A Canadian-led Open Skies observation mission over Ukraine went off without a hitch Thursday, staying well away from the violence-plagued east of the country. While the CC-130J Hercules from CFB Trenton was airborne, about 14 Ukrainians were killed when their helicopter was shot down by separatists firing surface-to-air-missiles. “Given the threat level in the east of Ukraine it was prudent not to go there because we are not armed,” said Col. Peter Williams, director of Verification Canada, an Ottawa-based military unit which oversees Canada’s part in Organization for Security and Cooperation in Europe (OSCE) flights over Europe and North America. 9 June 2014 - Fox News Insider - An Arkansas home was struck by an errant 155mm artillery shell from a nearby military installation. The incident occurred last week, though luckily no one was hurt. The live-fire training was being conducted at Fort Chaffee by a Missouri National Guard unit. A commander at the base said he was relieved no one was injured, adding officials are "very passionate about ensuring this type of incident never happens again." 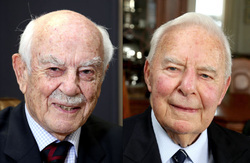 13 May 2014 - Kingston Whig-Standard - This year, the 70th anniversary of that feat, two of Kingston's own are being honoured by France for their part in the liberation. Kingston developer A. Britton Smith, 94, and former Royal Miltary College Commandant Brig.-Gen. William Turner, who is slightly younger, have both been awarded the rank of Knight of the French National Order of the Legion of Honour (Chevalier dans l'Ordre national de la Legion d'honneur), effective March 2. Turner shipped out in early 1943 as a lieutenant with the 23rd Field Regiment and was among the reinforcements after the invasion launched. "I went over after D-Day on a liberty boat," he recalls, on a sunny day when the water was so calm "I landed on the beach" at Courseulles-sur-mer, "without even getting my feet wet." He remembers being told they'd have a day or two to orient themselves, but "we went straight into action that night." By the time Turner got to Holland he was promoted to captain, serving as forward observation officer with the 15th Canadian Field Regiment RCA. 10 May 2014 - The Aviationist - A mini unmmaned aerial vehicle, did not reach the desired landing zone during artillery drills. And disappeared. The Flyeye drone has lost contact with the ground operator on May 7, near Torun, Poland, when it was going to land and was redirected towards the alternative landing zone near Skulsk. It never reached the place eventually. Several other UAVs and a ground search group are also looking for the lost drone but where unable to locate it due to the difficult terrain conditions. The cause for the unmanned aircraft not reaching the landing zone is still unknown. Since the drone was flying a training sortie, representatives of the manufacturer were also present during the drill. These ruled out the operator’s error as a possible cause for the incident that, instead, might have been caused by Software error, since the new version of code was tested during the drill. 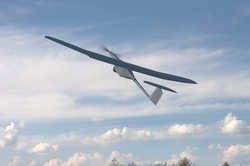 Flyeye is manufactured by the Polish company WB Electronics, which is a part of a larger Flytronic company. Its first public appearance took place in Paris, during the Eurosatory Arms Fair in 2010. Its operational use included SAR operations in Poland and mission flown for Nil (Nile) – one of the Polish Special Operations Units. The mini-UAV has also found a wide application during the Afghan conflict. 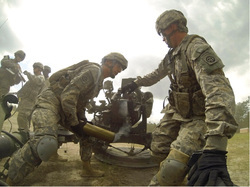 8 May 2014 - Yakima Herald — Army artillerymen training in the high desert of Central Washington this week can tell you they’re getting ready for a nine-month deployment to the Middle East. They’re just not free to tell you exactly where they’re heading — except that it won’t be the familiar combat zones of the last decade. “It’ll be fun to try something that’s not Iraq or Afghanistan,” said Capt. Greg Perrault, the headquarters battery commander for Joint Base Lewis-McChord’s 5th Battalion, 3rd Field Artillery Regiment. It’s a new assignment for a unit that spent the past few years clearing roads of mines in Iraq and firing rocket batteries in Afghanistan. When they hit the ground overseas this summer, they’ll work with troops from a partner nation while manning the Army’s High Mobility Artillery Rocket System (HiMARS). 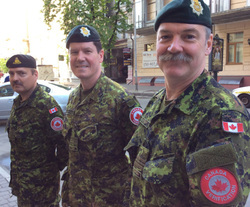 6 May 2014 - canada.com - the only Canadians with combat boots on the ground in Ukraine have been three army officers from the Ottawa-based Directorate of Arms Control Verification, who work here under the auspices of the Organization for Security and Co-operation in Europe. The Canadians and the other six members of their team were to have replaced a German-led team in eastern Ukraine. But when those soldiers were taken hostage by pro-Russian separatists, the Canadian-led mission, which was here at the invitation of the Ukrainian government, switched its focus to the south. 30 April 2014 - canada.com - Canada is stepping into the increasingly tense showdown between Kyiv and Moscow over the future of eastern Ukraine by taking over leadership of the Organization for Security and Cooperation in Europe’s observer mission in the central European country. 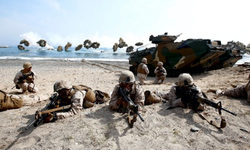 29 April 2014 - Voice of America News - North Korea has begun live-fire artillery exercises near its disputed western sea boundary with South Korea. South Korean military officials said the North fired 50 rounds of artillery and that none landed in South Korean territory. The North held similar drills last month. Some of the artillery landed in the South's waters, prompting Seoul to fire back across the boundary. 27 April 2014 - The Sunday Times - North Korean leader Kim Jong Un receives applause as he guides the multiple-rocket launching drill of women's sub-units under KPA Unit 851, in this undated photo released by North Korea's Korean Central News Agency. 21 April 2014 - Mail Online - The King's Troop Royal Horse Artillery fired a 41-gun royal salute from Green Park in central London at midday, using six 13lb First World War guns drawn by 71 horses. 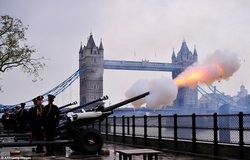 An hour later the Honourable Artillery Company fired a 62-gun royal salute from Tower Wharf by the Tower of London. Before the King's Troop arrived in Green Park, the Band of the Honourable Artillery Company and Royal Yeomanry played a selection of celebratory music close to the firing position. 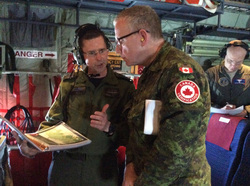 12 March 2014 - RCAF News - It might have been an Air Force story, but congratulations should go out to the two Artillery Officers in the photo! Colonel Stéphane Boucher and Colonel Ivars Miezitis, well done and welcome home! 5 March 2014 - Army Public Affairs - Kabul, Afghanistan— Joining the Canadian Army gave Captain Anne Pham the direction she needed. “It gave me focus and drove everything,” said Capt Pham. She was taking a variety of classes at the University Manitoba and didn’t know what to focus her attention and energy on. In 2006, while still a student, she joined the reserves to help pay for her studies, and discovered that a military career suited her. Though trained as an artillery soldier, she is working out of trade as a Task Force Staff Information Management Officer in Kabul, Afghanistan. “I manage all the information in theatre: network and paper information. I oversee the repatriation project. 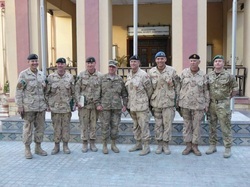 Canadian soldiers have been stationed in Kabul since 2011, all information generated on computers, papers and servers needs to be accessed and documented for historical and archiving purposes,” Capt Pham explains. When not on overseas deployments Capt Pham serves in Shilo, Manitoba with the 1st Royal Canadian Horse Artillery. 15 April 2014 - The Guardian - Under a canopy of trees on the edge of a large field, soldiers from Bravo Battery are lying in a circle as they pore over targeting charts. Nearby, others are preparing the howitzer cannons as helicopters swoop overhead. At the edge of the circle, the platoon leader watches as the field artillerymen go through their training exercise. No one seems to notice the small knot of hair at the base of the lieutenant's helmet, or that 1st lieutenant Kelly Requa is the only woman on the field at Campbell's Crossroads on the sprawling grounds of Fort Bragg. By January 2016, the US military must open all combat jobs to women or explain why any must remain closed. The Army in November officially began assigning female officers to lead the cannon platoons and plans to open other jobs, including those of crew members within the field artillery units. 16 April 2014 - Orléans Online - The race to see who will run against Ottawa-Orléans MP Royal Galipeau in the next election is officially on after retired general Andrew Leslie announced his intention to seek the local Liberal nomination Wednesday night. Speaking in front of more than 200 supporters at the MIFO cultural centre in Orléans, Leslie explained why he's decided to enter the political arena after a successful military career, and what he'll do should he win the nomination and go on to become the riding's next member of parliament. Leslie made his candidacy for the nomination official after recently getting the mandatory green light from the Liberal Party of Canada. Every candidate who wants to run for the Liberals must first get clearance from the party. It's common practice among all three parties at both the federal and provincial levels. 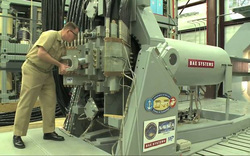 9 April 2014 - The Independent - The US Navy has announced plans to deploy its first ever electromagnetic railgun, a “game changing” device that fires projectiles without explosives over a distance of 100 miles and at seven times the speed of sound. Railguns use an electromagnetic force known as the Lorentz Force to rapidly accelerate projectiles between a pair of conductive rails, firing them at a velocity greater than can be achieved by traditional guns and artillery. 8 April 2014 - Associated Press - Baggage screeners at Chicago's O'Hare International Airport have discovered two World War I artillery shells in checked luggage that arrived on a flight from London. The Transportation Security Administration says the bags belonged to a 16-year-old and a 17-year-old who were returning from a school field trip to Europe. TSA spokesman Jim McKinney says a bomb disposal crew determined the shells were inert and no one was ever in danger. The teens told law enforcement they obtained the shells at a French World War I artillery range. It was not clear how. 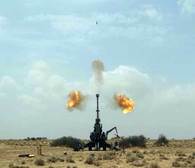 8 April 2014 - Express - Defence giant BAE Systems was glowing yesterday as it sealed a £16.8million deal with the Ministry of Defence to make artillery shells. 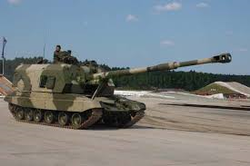 BAE said it will immediately begin producing the 105mm illuminating white and infrared shells, known as L43A5, at its factory in Karlskoga, Sweden, with the rounds set to be delivered between 2014 and 2016. 6 April 2014 - Salt Lake Tribune - Field artillery entails soldiers hauling modern-day cannons onto the battlefield and firing them at the enemy. 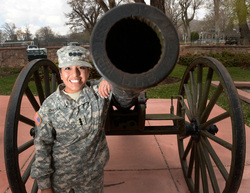 After Chavez earns her commission as a second lieutenant next month and graduates from Westminster College, she’ll be among the first women allowed to lead field artillery soldiers into combat. 31 March 2014 - ISN - ETH Zurich - While defense budgets continue to shrink in other parts of the world, the demand for new weapon systems continues to grow across much of the Asia-Pacific region. Today, Gordon Arthur looks at the regional market for artillery systems and assesses who is locally able to build what. 11 March 2014 - Office of the Premier - Craig Dalton has been appointed deputy minister of Public Safety in New Brunswick. 10 March 2014 - BBC News Wiltshire - The Army has suspended live firing on Salisbury Plain while it investigates why an artillery round apparently flew about five miles off course. 9 March 2014 - Defense News - Tighter budgets and changing threats are forcing specialized Israeli Army corps to temper parochial ambitions to bolster a smaller, fire-fortified, combined arms maneuvering force. 28 January 2014 - Ottawa Citizen - The Canadian Royal Army has enlisted the help of Picatinny engineers to evaluate the life-span of their World War II-era C3 Howitzer. The C3 Howitzer is a 1950′s technology that the Canadian Army is trying to keep in service for ten or 11 more years.